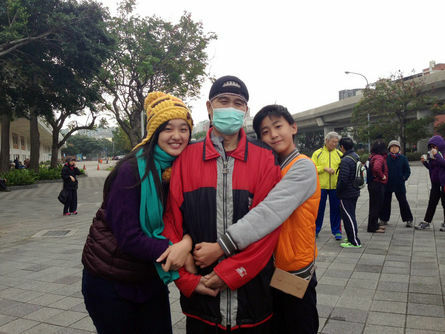 Ku Chin-shui (center) and his daughter (left) appears in a walking activity on January 1, 2016. Ku Chin-shui, Taiwanese decathlon silver medalist of the 1990 Asian Games, died of leukemia at the National Taiwan University Hospital (NTUH) on Wednesday morning. Ku, 56, is survived by his wife, his daughter and son. His family members, relatives and friends were by his side when he passed away. After his incredible feats in the realm of track and field athletics in the ‘80s and culminating in 1990, Ku was projected into the media spotlight again after a Uni Air flight on-board explosion incident in 1999 that implicated him. Ku was prosecuted for allegedly masterminding the explosion and a judge initially sentenced him to a 10-year prison term, which was shortened to seven-and-a-half-years upon appeal. It took Ku 12 years and up to five retrials to clear his name in 2011. Ku was a teacher before the incident, but the long legal battle and the lingering stigma cost Ku his job and financial stability. He was forced to take odd jobs to make a living for many years. In 2008, Ku passed an examination and became a teacher again. However, the ordeals for Ku and his family did not end there, as he was diagnosed with leukemia in 2014. His conditions got better for a time after undergoing a bone mallow transplant at the NTUH. However, he came down with pneumonia in April and was hospitalized again. Since then, Ku’s conditions had taken a downward spiral until his death on Wednesday morning.